San Lorenzo Marine Archipelago National Park is a national park of Mexico located on San Lorenzo Island part of an archipelago in the Gulf of California off the eastern coast of Baja California. The San Lorenzo Archipelago is considered one of the most important ecological areas of the Gulf of California. The Island and surrounding areas are part of a rich ecosystem comprised by a grand variety of flora and marine fauna. This area is protected by the Mexican federal government Norma Oficial Mexicana NOM-059-SEMARNAT-2001 because of its importance as a habitat for several endangered species. 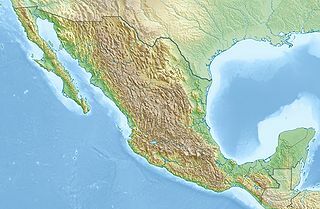 The Archipelago is part of the municipality of Mexicali, Baja California. The island is located southeast of the city separated by the Salsipuedes Channel. San Lorenzo Marine Archipelago National Park was created as a marine national park to protect the fragile and important ecosystem of the San Lorenzo Archipelago by national decree on April 25, 2005. The rich marine biodiversity with a significant number of threatened, vulnerable, and endangered species has made it imperative that the Mexican federal government protect this area. This area is also important as a commercial, cultural, and recreation area. The park is comprised by the Archipelago islands of San Lorenzo, Las Animas, Salsipuedes, Rasa, and Partida with the surrounding maritime border of the islands with a total area of 50,442 hectares. The Archipelago islands are surrounded by deep, cold water rich in nutrients in the center part of the Gulf of California also known as the Sea of Cortez. Most of the park is comprised by maritime area. The small terrestrial portion consists of rugged islands with irregular coastline eroded with many sea cliffs. The Archipelago islands exhibit dramatic topological changes where elevation goes from sea level to 485m above sea level. The highest elevations are found on San Lorenzo Island towards the southern end. Climate considered dry desert with an estimated annual rainfall of 2.54 in and an average annual temperature of 75°F. High levels of solar radiation and constant prevailing winds result in high evaporation rates. The San Lorenzo Archipelago Islands experience hot summers where temperatures during the hottest months of the year (July and August) reach between 95°F to 104°F. Winters are warm with an average low temperatures reaching 52°F during the coldest months of the year (January and February). Winds affect the islands' weather, but they have a more significant effect on the sea conditions. Winds prevail from the northwest in the winter which brings nutrient rich waters from the Pacific Ocean into the Gulf of California, but during the summer the winds prevail from the south having the opposite effect on the currents. San Lorenzo Marine Archipelago National Park has unique ecosystems and habitats. These ecosystems support a great nutritional pyramid important to marine animals, birds, and surrounding human settlements. The rich waters of the Gulf of California is home to over 800 species of fish and 2,000 species of invertebrates. The islands may seem barren due to the lack of fresh water and arid conditions allowing only a few desert shrubs and cactus. The marine flora consists of several varieties of algae. The algae serves as an ideal habitat for small marine species. The islands also sustain a great number of bird species consisting of native species and migratory species that are attracted to the rich marine ecosystem. Some of the most observed species of birds include: Cooper's hawk, golden eagle, peregrine falcon, Columbidae, magnificent frigatebird, brown pelican, and Nazca booby. ^ http://www.conanp.gob.mx/sig/decretos/parques/Sanlorenzo.pdf Decreto que crea el Parque Nacional Marino Archipiélago de San Lorenzo". En formato .PDF. Consultado el 29 de diciembre de 2008. ^ a b "Se decreta el Parque Nacional Marino Archipiélago de San Lorenzo" Archived 2016-03-03 at the Wayback Machine. Reportaje de la web de la CONANP en formato PDF. Consultado el 3 de enero de 2009. The Gulf of California is a marginal sea of the Pacific Ocean that separates the Baja California Peninsula from the Mexican mainland. It is bordered by the states of Baja California, Baja California Sur, Sonora, and Sinaloa with a coastline of approximately 4,000 km (2,500 mi). Rivers which flow into the Gulf of California include the Colorado, Fuerte, Mayo, Sinaloa, Sonora, and the Yaqui. The gulf's surface area is about 160,000 km2 (62,000 sq mi). Depths range from fording at the estuary near Yuma, Arizona, to in excess of 3,000 meters (9,800 ft) in the deepest parts. 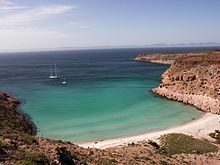 Bahía de los Ángeles is a coastal bay on the Gulf of California, located along the eastern shore of the Baja California Peninsula in the state of Baja California, Mexico. The town of the same name is located at the east end of Federal Highway 12 about 42 miles (68 km) from the Parador Punta Prieta junction on Federal Highway 1. The area is part of the Ensenada Municipality. Alejandro de Humboldt National Park is a national park in the Cuban provinces of Holguín and Guantánamo. It is named after the German scientist Alexander von Humboldt who visited the island in 1800 and 1801. The park was inscribed as a UNESCO World Heritage Site in 2001 for of its size, altitude range, complex lithology, landform diversity, and wealth of endemic flora and fauna. The Abrolhos Marine National Park is a national park that was established in 1983 covering most of the Abrolhos Archipelago area in the state of Bahia, Brazil. The Cíes Islands are an archipelago off the coast of Pontevedra in Galicia (Spain), in the mouth of the Ria de Vigo. They belong to the parish of San Francisco de Afora, in the municipality of Vigo. They were declared a Nature Reserve in 1980 and are included in the Atlantic Islands of Galicia National Park created in 2002. Fernando de Noronha Marine National Park is a national park in the state of Pernambuco, Brazil. The Atlantic Islands of Galicia National Park is the only national park located in the autonomous community of Galicia, Spain. It comprises the archipelagos of Cíes, Ons, Sálvora and Cortegada. The park covers a land area of 1,200 ha and a sea area of 7,200 ha. It is the tenth most visited national park in Spain. It was the thirteenth national park to be established in Spain. Bahía Portete – Kaurrele National Natural Park is a national natural park in Uribia, La Guajira, Colombia. The northernmost national park of mainland South America is located at the Caribbean coast of the La Guajira peninsula in Bahía Portete, between Cabo de la Vela and Punta Gallinas. Established on December 20, 2014, it is the most recently designated national park of the country. As of 2017, 59 nationally defined protected areas are incorporated in Colombia. The park hosts a high number of marine and terrestrial species. Constitution 1857 National Park is located in the pine forests of Sierra de Juárez mountain range in the northern part of Baja California, Mexico. The park is an important preserve for a large number of native wild animals like Bighorn Sheep and Mule Deer. The park is characterized by the large variety of coniferous species. Cumbres del Ajusco National Park is one of many national parks near Mexico City, DF. The Ajusco is known for its high elevations reaching 3,900 meters (12,795 ft) above sea level and is visible from any part of Mexico city. The park is characterized by pine-oak forests and high mountain grassland. Cumbres del Ajusco means "watered grove peaks", an appropriate name for this mountainous region covered with lush green forest with many flowers due to a fair amount of precipitation. The Balsas and Lerma rivers begin in the heart of the Cumbres del Ajusco. The Old Providence McBean Lagoon National Natural Park is a national park located on the northeast side of Providencia Island in the Archipelago of San Andrés, Providencia and Santa Catalina, Colombia. The Rosario and San Bernardo Corals National Natural Park is a natural park located in the Sucre and Bolívar Departments on the coast of the Caribbean Region of Colombia, 45 km from the Bay of Cartagena. It was the most visited national park in Colombia in 2009, with 318,473 visitors. The Cabrera Archipelago Maritime-Terrestrial National Park is a national park that includes the whole of the Cabrera Archipelago in the Balearic Islands, an autonomous community that is part of Spain. The park covers 100 square kilometers, though 87 square kilometers is covered by water. The park attracts relatively few visitors due to its remoteness. There is no permanent population, but there might be at any given time just under 100 National Park staff members and other personnel on the islands. Cabo Pulmo National Park is a national marine park on the east coast of Mexico's Baja California Peninsula, spanning the distance between Pulmo Point and Los Frailes Cape, approximately 100 kilometres (62 mi) north of Cabo San Lucas in the Gulf of California. Bahía Pulmo is home to the oldest of only three coral reefs on the west coast of North America. Estimated to be 20,000 years old, it is the northernmost coral reef in the eastern Pacific Ocean. The Ilhas dos Currais Marine National Park is a national park in the state of Paraná, Brazil. It protects an important nesting site for birds, and is a refuge and feeding ground for fish including two endangered species of grouper. It may be visited for diving, but visitors must be careful to avoid any impact on the environment. Exequiel Ezcurra is a Mexican plant ecologist and conservationist. His highly interdisciplinary work spans desert plant ecology, mangroves, island biogeography, sea birds, fisheries, oceanography, and deep-sea ecosystems. Bahía de Loreto National Park is a national park on the east coast of the Baja California Peninsula in Mexico, about 203 kilometres (126 mi) north of the city of La Paz in the state of Baja California Sur. The park protects 2,065.81 square kilometres (797.61 sq mi) of relatively pristine marine ecosystem in the central Sea of Cortez, including five large uninhabited islands and many smaller islets in Loreto Bay. It is known for its great variety of coastal environments, such as sandy beaches, sea cliffs, submarine canyons, and marine terraces, and is home to an exceptionally high biological diversity, especially of marine mammals.